I was born in the ‘happy days’ of the 50’s and raised in Southern California during the "turbulent and ‘counter-cultural' 60’s". In the roaring 70’s, I completed high school, college and got married. We began having our four children in the booming 80’s and 90’s. In the 21st century we moved to Cambria to Pastor the Vineyard Christian Fellowship church. In addition to being a Pastor I’ve had a variety of career and job experiences that include: Cable T. V. Line Technician, Insurance Adjuster, and Spacecraft Track Controller at J. P. L. As far as hobbies go -- in addition to reading, camping and hiking -- I enjoy outings with my family and an occasional game of chess. 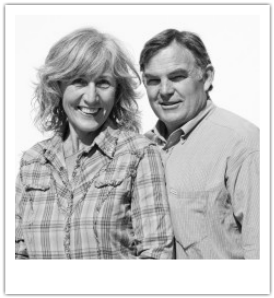 We have been Vineyard pastors since 1980 with a BA degree in Christian Ministry. During our years in ministry we planted two Vineyard churches in California; one being the Cambria Vineyard where we are serving now. The other was the Concord Vineyard in the bay area. After sending out and visiting missionaries on the field, our hearts were stirred to go and offer them pastoral care. So we then moved to Europe in 2000 for cross cultural training and lived in France near Geneva Switzerland, working at a debriefing center for missionaries. Over that decade we traveled through Africa, the Middle East and Europe providing pastoral care and debriefing for workers and leading mission team retreats. Currently our roles here are for spiritual care and formation of men and women. Our desire is to mentor, coach and release others in to their God-given gifts to serve Him and the world around. 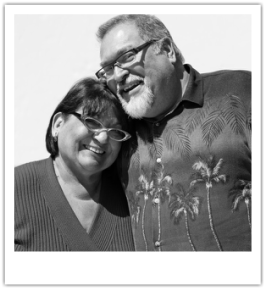 Daniel is an enthusiastic preacher of the heart and Denise a woman of worship and the arts. One of us grew up here in Cambria; the other is from Virginia. We've both been involved in ministry in one form or another for many years. We enjoy Netflix, hanging with people, talking about God-stuff, and our new Ketogenic diet. Most importantly, though, is our love for Jesus and his bride - the Church. We long for the day we get to see him face-to-face, and consider it an honor to help prepare his bride for that glorious day! I started teaching in Sunday School by helping my mom when I was in Jr. High in 1968 and I’ve kept it up ever since! Anything to do with kids and teaching and I’m happily using the gifts God gave me. I started teaching here at the Vineyard when we were on Bridge Street back in 1995. Before that I was the children’s ministry director at Cambria Presbyterian Church. ​One of my favorite scriptures is Jeremiah 29:11. I enjoy helping kids get to know God and His good and hopeful plans for their lives, too. My hobbies include anything outdoors: kayaking, riding a horse, gardening, hiking, or skiing. I became involved in youth and worship ministry in my teen years, and later, worked as a college instructor. I married in 1982, and had some challenging years in rearing up our four amazing kids! I returned to worship ministry to encourage my kids to be part of what I love the most: glorifying God through music and dance. I believe that it is our purpose to lead them in serving the Lord (Joshua 24:15, “But as for me and my household, we will serve the Lord.”). With the guidance of God and the church where they grew up, they have been using their talents for God’s glory! We have been involved with: prayer, children, fellowship, and worship - all ministries of Jesus Christ the Savior Christian Fellowship in the Philippines. Coming to Cambria in 2009 with my husband and our two teenagers was the greatest challenge that our family experienced; we were separated from our other two kids. God pulled us out of our comfort zone - and in His greatness - directed us here to Cambria Vineyard Church. Here we felt the genuine love and acceptance. ​We are “home” again - a place where are able to serve and share the talents that HE has given us for the HIS glory!